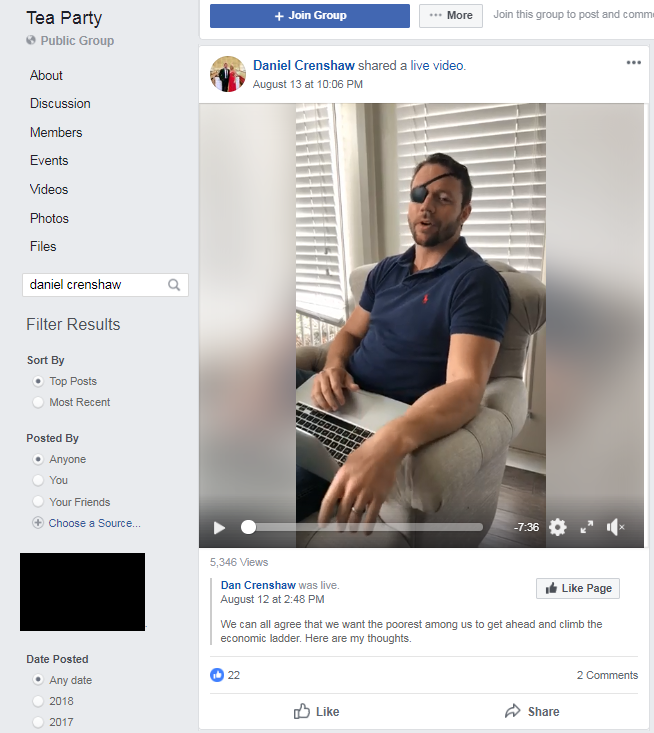 Rep. Dan Crenshaw‘s (R-Texas) past as an administrator for a Facebook group that served as a haven for racist, white nationalist and Islamophobic rhetoric is being subject to another round of scrutiny after his repeated attacks on fellow Rep. Ilhan Omar (D-Minn.). On Tuesday, Crenshaw ignited the controversy by sharing an out-of-context quote from a recent speech Omar gave to the Council on American Islamic Relations (CAIR). During the speech, Omar was making a point about a collective wave of Islamophobia washing over America in the aftermath of 9/11. Crenshaw, however, isolated the phrase, “some people did something” in an apparent bid to accuse Omar of minimizing the incident of terrorism. “Unbelievable,” the freshman GOP congressman tweeted. The next day, Fox & Friends re-shared the out-of-context quote and host Brian Kilmeade went on to question whether Omar was actually American. Kilmeade later backtracked from that position. Omar responded to Crenshaw and Kilmeade in a single tweet, accusing them both of “dangerous incitement” due to the recent spate of death threats that have been leveled against her. Crenshaw then went on NBC to attack Omar again–accusing the oft-threatened congresswoman of exaggerating the severity of the incident. That’s when Twitter called foul. Others noted that Crenshaw, despite his criticisms of Omar over her 9/11 comments, has yet to support renewing the 9/11 Victim Compensation Fund–and that Crenshaw allegedly brushed off a 9/11 firefighter who confronted the conservative congressman over his opposition to the fund. Such criticisms eventually led to people dredging up Crenshaw’s tenure as an administrator for the Tea Party Facebook group, whose members frequently trafficked in racist, white nationalist and Islamophobic rhetoric and ideology. I made a thread of the racist, sexist, homophobic, and Islamophobic posts from the Facebook group Dan Crenshaw was an admin for and member of. The attack is even more virulent considering Crenshaw’s past as an administrator for a racist Facebook page. As liberal watchdog Media Matters reported in August 2018, Crenshaw joined the group in May of 2018 and repeatedly shared Facebook videos from his congressional campaign with the group. 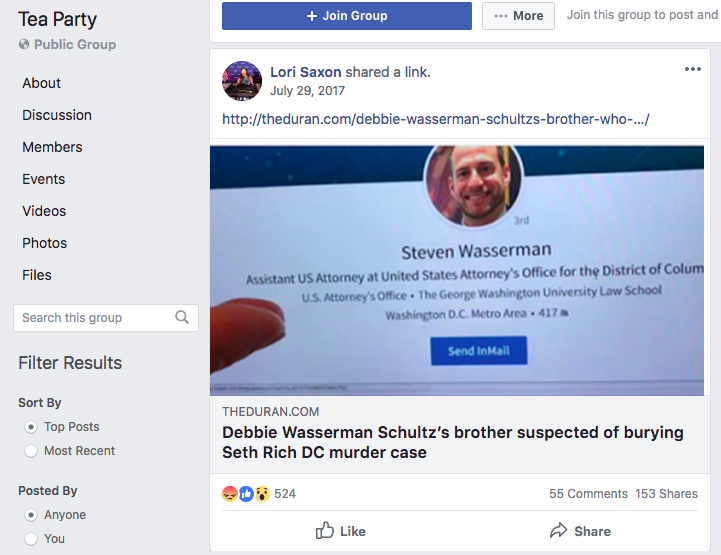 Other frequent posts in the group included promotion of the Pizzagate conspiracy theory, the Seth Rich conspiracy theory, anti-Muslim and anti-black racism–and even posts which defended the white nationalist and alt-right Unite the Right rally in Charlottesville, Viriginia which ultimately claimed the life of socialist Heather Heyer. Other moderators and administrators for the Facebook group have been dubbed white nationalists–such as Pamela Geller and Tom Tancredo. Crenshaw was one of five Republican candidates for office who were members or administrators of the group before the Media Matters report. All five of said GOPers left the group after the report was publicized. Now, in the midst of full-on Twitter warfare between Omar and Crenshaw, the Twitterati is loath to let Crenshaw forget about his past.